Most of the art is from Vietnam. It is what they call Vietnamese Street Art. I lived in Vietnam during the embargo which Clinton ended in 1994 and for three years after that. The professional artists under the Communists worked for the government and were paid $20.00 a month. You could buy their art in portfolios in little shops on street corners. It is beautiful. Sometimes these works were done on silk (like the grey pieces near the TV in the living room) or on handmade paper. The art and shops and artists had disappeared by 1997. I have a write up about this art from an exhibit that I can fax or mail to you. The artists are unknown, although they signed their work. This art is in your bedroom, bath, and over the couch. I only wish I had purchased much, much more of it. 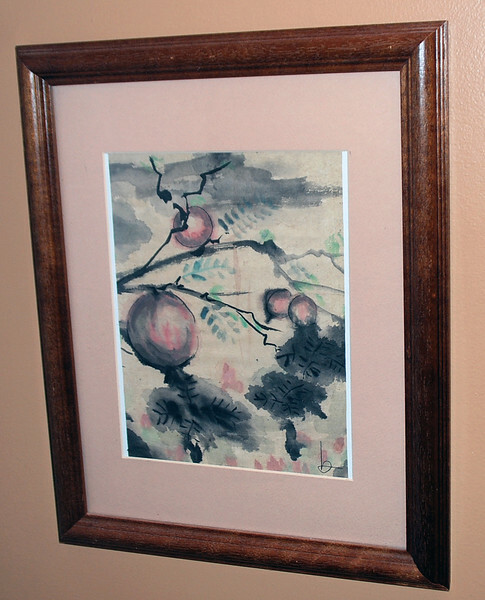 On the other hand, the lithograph signed prints in the living room near the eating table that are black on cream colored handmade paper depicting acting figures--also I believe over the desk and on the living room wall near the kitchen--are very valuable. They are hand signed by the Vietnamese artist Dinh Luc. He has won many awards all over the world. The swan photo near where the hall enters the living room is from a very famous Japanese photographer, Tokutaro Tanaka. It was given to me by Japanese businessmen when I worked for IBM as a gift when I did them a big favor. It would have been purchased by the company and it is customary for gifts to be original and valuable. I left information about both the photographer and the photo in the picture frame behind the photo. I recall it was an award winning photo. The statues on the high shelf in the great room are Chinese. They were actually purchased at the beach in a place in Fenwick. I think it is called Pottery Place. It is on the right when you go towards Ocean City on Route 1. The living room sculpture table came from there also. You can still find some interesting things there if you look closely. The young women in the bedroom pictures by the closet are Vietnamese wearing the traditional dress. These were painted in the 90's. The pronunciation of the costume is o zai. Back then they could be seen wearing these tunics with pants on their bikes, but more and more in the cities it would be on Honda motor scooters. Now I am sure in the cities they are mostly wearing western clothes. The print in your master bath is from Dong Ho village. In the areas around Hanoi, the various villages had different occupations. Dong Ho did very famous prints. The part of my life when I lived and worked in Asia was very enjoyable and I'm pleased that the people to whom I was able to pass along a very small piece of that appreciate it. Enjoy! Photos of the art at our Sea Colony condo.